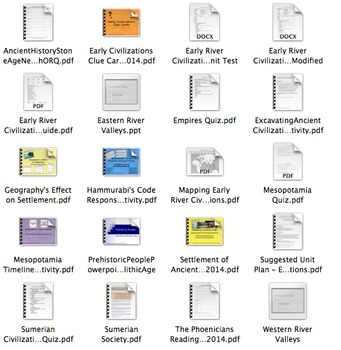 Early River Civilizations Unit Plans and Materials UPDATED! 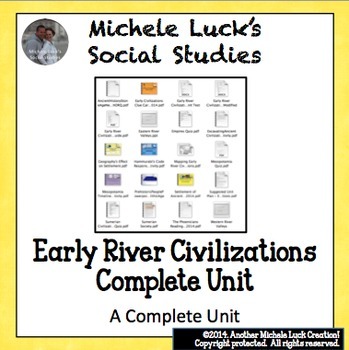 Looking for a complete unit to cover the Early River Civilizations? Want a complete unit filled with engaging resources? Hoping to find resources that will encourage skills practice while studing the Earliest Civilizations? UPDATED! This is a complete unit for the introduction of the early civilizations. Includes the Indus and Huang Ho River Valley Civilizations as well as introduction to Sumer and the rest of Mesopotamia. Suggested Plans are as a unit with daily outlines of activities with bellringers and exit assignments. Package includes unit tests for general students and modified classes. Powerpoints are included for the Eastern River Civilizations, Western River Civilizaions, and Prehistoric People. Also includes some student handouts and assignments for the unit. This is one unit I am listing for Ancient World History. (Lesson Plans also cover Egypt Unit - also available on TpT). Also see my other Complete Ancient World and Modern World Units.